IMPORTANT UPDATE: Natural Gas Power Plant in Town of Ulster not on tonight’s Town of Ulster Town Board Agenda. 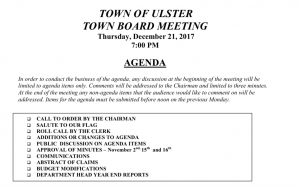 The Town of Ulster Town Board meeting agenda was posted this afternoon, and the proposed Lincoln Park Grid Support Center was not on it. It is not unusual for their agendas to be updated closer to meeting time, so we called the Town of Ulster Clerk’s office (and spoke to Suzanne who is always very helpful) who confirmed that the applicant pulled their item from the agenda tonight, and that there will be no discussion on SEQR and therefore, no determinations will be made. She also stated that the applicant wished to do more outreach into the community before going forward at this time to gauge the public’s concerns. If you still are planning to attend tonight’s meeting, a reminder that the public can speak only on items that are on the agenda during the public comment period at the start of the meeting. If you wish to address items that are not on the agenda, you may do so during the second public comment opportunity at the end of the meeting. KingstonCitizens.org will film the meeting tonight from start to finish thanks to Clark Richters and the Kingston News. We view this as a positive step. A very special thank you to our coalition partners for all of their efforts. Lets continue to build our coalition and work collaboratively together on each important step as we proceed. Stay tuned, and friend our FACEBOOK page for updates. TOGETHER, LETS CONTINUE TO TRANSITION OUR ENERGY SYSTEM IN THE MID-HUDSON VALLEY. From 2011 to 2016, the Mid-Hudson Valley region placed second in the state for the most solar installations, seeing an increase of 1,164% in Megawatts installed and an increase of 944% for projects installed. “Under Governor Cuomo’s nation-leading Reforming the Energy Vision strategy, solar power is integral to driving the State’s clean energy economy while reducing harmful greenhouse gas emissions. Clean, renewable energy will help the State meet its aggressive energy goals, make electricity more affordable for New Yorkers and bring about a more resilient and versatile energy system.” -RIichard L. Kauffman, Chairman of Energy and Finance for New York said. Lets continue our efforts in transitioning our energy system as leaders in the state with a 100% renewable energy project.